We parked just outside of the Moose/Wilson road entrance to the Park on a side road that runs perpendicular to the main road. The advantage of doing this is that you avoid the line of cars that sometimes queues up at the booth. Most people park at the Granite Canyon trailhead another mile further up on the road after entering Grand Teton National Park. But we had plenty of time and wanted the exercise. 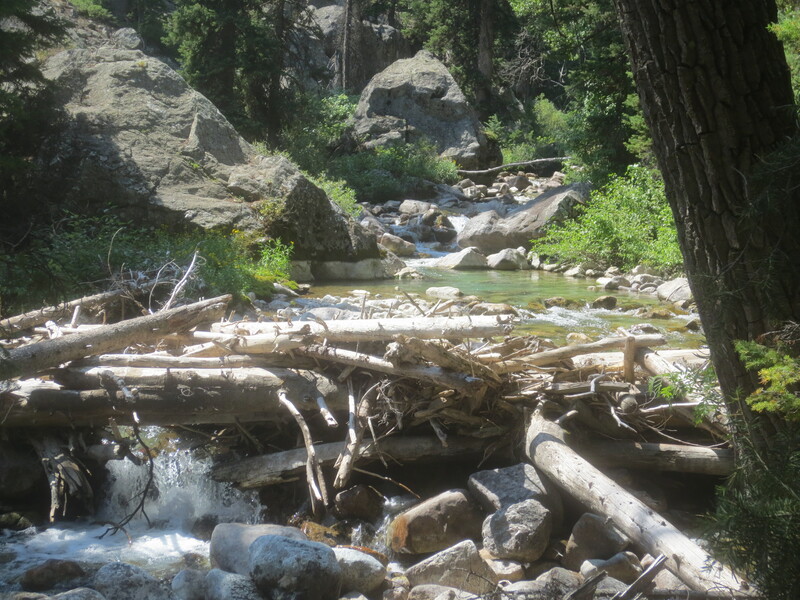 Our plan after walking to the trailhead was to go another mile on the Granite Canyon trail until it crosses a fast moving stream on a well-built bridge. 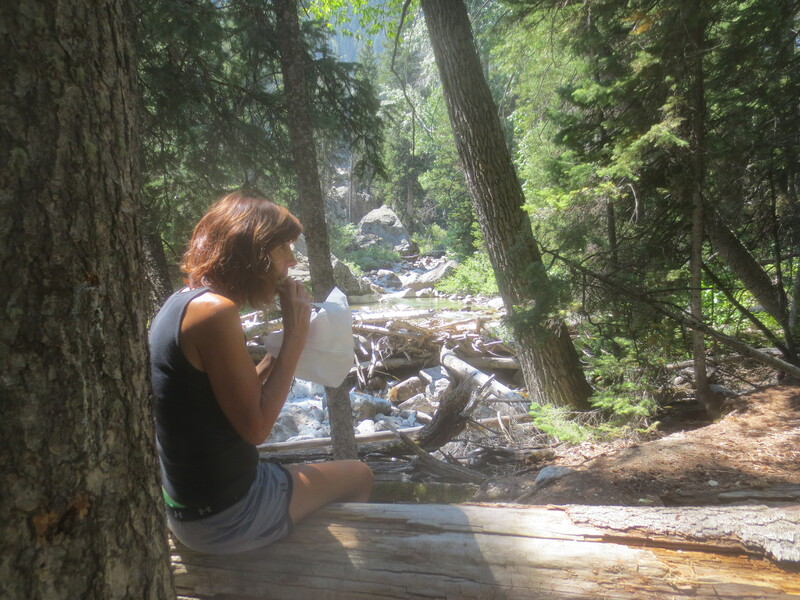 There we were going to split a sandwich, drink in the view, and relax with the sound of rushing water. We even brought our Kindles to get in a few minutes of reading. A couple hundred yards from the beginning of the trail the route passes adjacent to densely packed aspens on the left and then ascends a short rise that is just enough to get you breathing heavily but not exhaust you. At the top there are sweeping views of the mountains in front of you and a sagebrush tableau before you. We followed the trail, and sure enough after about twenty to thirty minutes and a trail intersection we came upon the bridge. There was plenty of shade, so the plan was a good one. But for some reason we kept going – and so should you. After the first bridge, the trail runs through a long stand of trees, ascends another short rise and then works along a bluff on the right that overlooks a relatively dry stream bed that is worth a short look. The trail then dips down, bears to the right and crosses a second bridge. Don’t stop now. A third bridge is only moments away. After crossing the third bridge you will come to a major trail intersection. At this point you will have travelled about 1.6 miles if you park at the trailhead. You then follow the sign directing you to turn left and then start your ascent up Granite Canyon. The beginning of this portion of the trail runs along Granite Creek. You may not always see it but you can almost always hear it. On your right you will see towering mountains and large rock fields. At times on your left there are large boulders that you will be tempted to clamber up. The path itself ascends rather quickly and in one spot there is a series of stone steps that, if they are present to prevent erosion are fine, but it is debatable if they make it easier to go up – or down for that matter. Fortunately, within only a few minutes you will see a small sign as you leave a boulder field and enter the forest that you are entering an area inhabited by bears. Of course, my wife jauntily told me there are no bears. For some reason I picked up a rock in my left hand, as if it would make any difference, and left my right hand free for the bear spray. Another few steps bring you to a small sign on the left announcing a camping area. Ignore it. Paradise is waiting only a couple minutes more up the trail. It is the next camping area I want you to explore. Perhaps another couple of hundred yards brings you to another camping area sign on the left. Follow that path. You will find a flat shaded area nestled within the trees. Your steps will be stilled by a layer of pine needles and soft earth. Fallen logs dot the area, some with a tree behind them that provide a back rest. The logs are at perfect height to allow your feet to dangle and sufficient diameter to provide a rather comfortable seat. And the view is to die for. Stretching west is Granite Creek. The water moves fast and immediately in front of you. Laying in the water is a driftwood jam, sufficiently porous to permit small curtains of falling white water to rush through it. Twenty feet beyond it are placid clear pools with greenish rocks below and white rock islands above that perfectly complement each other. But the beauty is not over. Above the pool is more falling water rushing through a rock garden that proves once and for all the superiority of nature over any human endeavor. What’s more, the stream is framed, and the joyous sounds channeled, by huge stones seemingly strategically placed. Above them looms yet another majestic mountain laden with shimmering rocks that slid down its northern flank perhaps thousands of years ago. I drank this in while shaded from the midday sun that was doing its best, without success, to reach my weary body. It took us a long time to leave – it was a moment and a view we will forever cherish. The way back was quick. 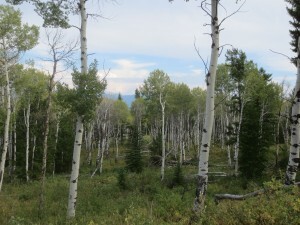 In total it is little more than two miles to the trailhead. It really is only a moderate hike and one well worth doing. If you should choose not to return right away and instead head further up into the canon the trail soon begins a quick ascent on switchbacks. The view is beautiful but there is really no purpose in going further unless you are heading for Marion Lake or Rendezvous Mountain and a return on the Tram. Either way it is an arduous long journey that is well worthwhile but it is a full day of hiking. Trust me, this four mile round trip hike to the stream (six miles from where we parked) is well worth a few hour excursion.